The last month has seen a spate of scientific studies underlining the increasing vulnerability of cities, infrastructure and landscapes in the face of climate change. One study by the University of Salford found that only a tenth of England’s extensive floodplains are adequately defended, putting an increasing number of homes and businesses at risk of flooding. Another study suggests that the “urban heat island” effect could intensify the impacts of climate change, making cities up to 7C warmer. Any hard-won victories over climate change on a global scale could easily be countered by uncontrolled damage at the local level. Now, more than ever, we should be accelerating our adaptation actions. According to the IPCC, there is a considerable scope to adapt to the impacts of climate change now with current scientific understanding, technology and know-how. Equally, in several sectors and areas, current adaptation approaches and technologies will not be enough. Innovation – in terms of governance, policy, regulation, finance and technology, for example – is needed to help tackle some of the thornier adaptation challenges such as in the agriculture sector, in the resilience of urban infrastructure and in our highly populated coastal deltas. One of the biggest adaptation barriers we face is asymmetric access to information on current and future climate risks. Some of the most detailed and accurate risk information is held by insurance companies, scientific institutions and modelling agencies. But it is most needed by cities, businesses, individuals and community groups. Information, data and tools on climate risks are often kept confidential, use highly technical language and are not searchable. Even if data is made available, there is a capacity gap that needs to be closed before the information can be used to inform choices. The European Union Adaptation Strategy, agreed in 2013, seeks to strengthen Europe’s resilience to the impacts of climate change. It focuses on three key objectives, including better informed decision-making by addressing gaps in knowledge about adaptation. EIT Climate-KIC, as Europe’s leading innovation catalyst for tackling climate change, is actively engaging partners, projects and start-ups in innovation for adaptation. Over the last five years, we have helped nurture over 50 adaptation start-ups and supported over 40 multi-partner adaptation innovation projects. Part of our approach is a commitment to better informed decision-making and tackling information asymmetry through disruptive innovation. This week, Climate-KIC launches its Adaptation Approach as part of the third European Climate Change Adaptation Conference, with a focus on building resilience in urban infrastructure and agriculture/forestry value chains. Climate-KIC has also been instrumental in developing the OASIS Hub, an online market place for trading free and commercial climate risk data, which launched this week. As an open access, crowd-sourced data platform for tackling some of the existing market failures for climate risk information, OASIS Hub embodies the approach to democratising the information and tools much needed for adaptation, but which have for, so long, only been accessible to experts. As it develops over the coming months, OASIS Hub will host tools, services and training courses to help future users of data to understand how to access, assess and employ the data for helping to make adaptation choices. Information that can be used between global and local Perhaps the greatest benefits that our approach and disruptive marketplaces like OASIS Hub can achieve is a mechanism for driving collaboration and co-operation from the local to the global levels – matching supply and demand. In a fortnight where we’ve seen that global efforts can start to unravel, it’s even more important that strong ties remain to defend against the damaging impacts of climate change. You can find out more about EIT Climate-KIC’s activities at the third European Climate Change for Adaptation Conference in Glasgow this week, and read our Adaptation Approach paper here. 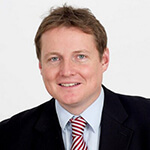 Tom Mitchell is Chief Strategy Officer at EIT Climate-KIC. Prior to joining Climate-KIC’s executive team, he was head of Climate and Environment at the Overseas Development Institute, and a research fellow at the Institute of Development Studies. Tom has served on the Intergovernmental Panel on Climate Change (IPCC) Working Group II coordinating lead author of the Special Report on Extreme Events and Disasters; and was a lead author of the IPCC 5th Assessment Report. He has a PhD from University College London on national level strategy planning for strengthening resilience to extreme events.